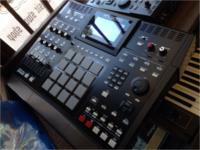 Groove Sampling workstation w/128MB Smart Media Memory Card and Card reader. MIDI PRODUCTION CENTRE. Integrated Rhythm Machine/ 16 Bit Drum Sampler/MIDI Sequencer, with 23 discs. (Installation and samples). MIDI PRODUCTION CENTRE *Expanded to 32mb. * Very Clean Condition! Runs globally on 100~ 240 Volt - Auto Switching! Stereo Digital Sampler. Made in Japan 1998. 64-voice polyphony. 256 MB Ram. 16 individual outs. USB connectivity. 2 x MIDI In/Out and Thru. 2 x SCSI connections. AES/EBU In and Out. Optical In and Out. MIDI PRODUCTION CENTRE *Expanded to 32mb. Onboard ZIP drive. Zip disk included. The most advanced MPC ever. MPCs are the unquestioned standard in studio and live beat and track production. 8 analogue out. USB. ADAT. 2 x xlr input. 64 MB memory, ver 2.0 software. Memory slot no cards supplied. Stock machine. 128-Track MIDI Sequencer and a 64-voice 24 bit Stereo Digital Sampler! Supports not only conventional Drum programs but also gives you the choice of selecting Keygroup programs allowing you to play 'conventional' multi-sampled sounds such as piano, bass, strings, synth, etc., from a keyboard just like our rack mount samplers - Compatible with the largest variety of sound libraries: Akai S1000, S3000 and XL series, S5/S6000, Z4/Z8, MPC2000XL, MPC3000, Roland S700 series, and EMU 3 and 4 series. The MPC3000 is not just an instrument, it's an entire Music Production Studio! Midi Production Centre - Roger Linn Model - RARE AND COOL! One knob broken but the shaft and pot are all good. Operating System 3.11 (06/11/96). 5MB RAM. Top shelf classic sampler / sequencer. Similar to the AKAI MPC3000. Made in Japan. SCSI Expansion board installed. In/Out board installed - Optical In/Out, Digital In/Out, 6 x Assignable analog outs. MIDI Stereo Digital Sampler with 8 outputs expansion installed. Digital IN/OUT, SCSI & 32 MB (16 Megawords) of RAM. *100 volt - requires step-down transformer. Display a little dark but still visible with the contrast on full. MIDI PRODUCTION CENTRE. Integrated Rhythm Machine/ 16 Bit Drum Sampler/MIDI Sequencer. * Screen is a bit tired and dark in the middle. Still legible though. The most advanced MPC ever. Excellent condition. MPCs are the unquestioned standard in studio and live beat and track production. 8 analogue out. USB. ADAT. 2 x xlr input. 192MB memory. 80 GB hard drive. 2GB Compact flash card. Ver 2.0 software. CD burner. Built in synthesiser. 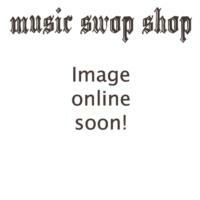 **De-registered by AKAI Support Staff** w/ hard case + manual. 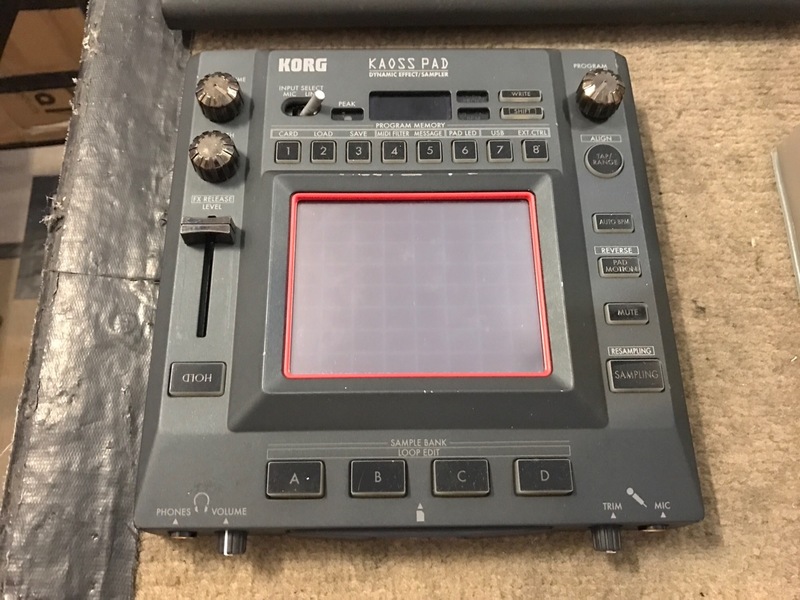 KAOSS PAD 2. Dynamic effect/controller. Made in Japan. 1998. Midi Stereo Digital Sampler. 64 voice. 256 MB Ram. 100-240v. 8 x analogue 1/4" outputs. 2 x SCSI ports. A+B midi In / Out / Thru. Enter your email address below to get alerts for Samplers & looping devices.